Seven minutes after sunset, 6:32 p.m. PDT, on Oct. 7, 2017, I encountered yet another feline on Alabama, close to Meade. 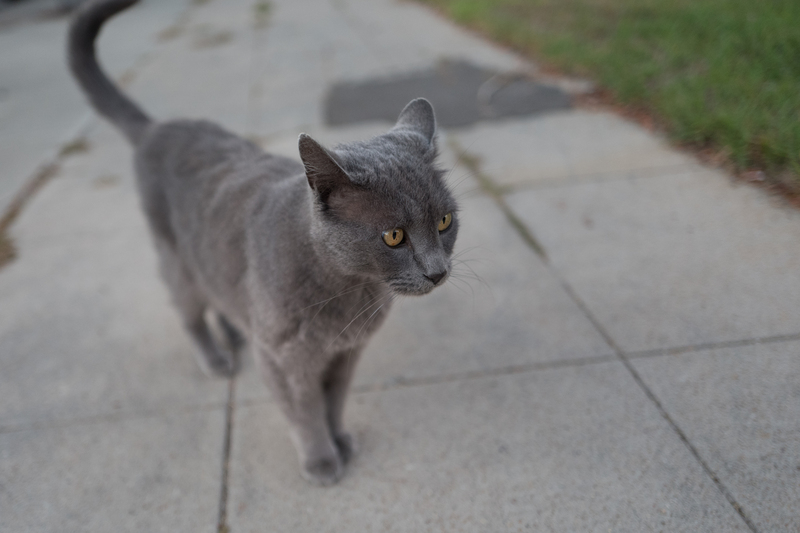 The kitty isn’t the first smokey grey in the series, but he is distinguished by having the color as name. Mystery: The increasing number of cats recently seen on or around that street. Why here? Also from Alabama: Goldie, Itchy Valentino (yes, real name), and Anthony. In the alley behind: Spry. On Meade or Monroe, respectively, close to the cross-street: Amanda and Bruce. The venerable Leica Q boasts best benefits when manual controls are used to shoot in low light. Deep dusk had already settled as I walked down Alabama and adjusted the camera dials. Vitals: f/1.7, ISO 500, 1/250 sec, 28mm. I manually chose wider aperture and faster shutter to capture more light and to diminish motion blur; ISO was on auto. The Featured Image is the keeper because it gives great bokeh; his head and face solely are in the field of focus. Addendum: I encountered Smokey/Gordo minutes after seeing the rental sign for the apartment that we would lease the next day. Not to be missed: Scruffy, Roly Poly, Woo, Skull, Biscuit, The Colonel, White, Chipper, Frisky, Stretch, Needy, Farfisa, Mates, Hunter, Pee-Pee, Blue, Blue Too, Bonded Pair, Patience, Fess, Jumper, Frenemy, Looker, Cozy, Scout, Lurks, Skit, Mini, Betty, Black and White, Stalker, Bell, Chill, Sammy, Scratch, Poser, Star, Grey and White, Watcher, Herman, Comet, Roman, Willow, Chub, Nimbus, Watson, Lilo, Kit, Pepe, Twilight, Sebastian, Spot, Booger, Ash, Veruca, Riley, Mellow, Bonde, Flower, Glass, Black, BeBe, Fang, Bruce, Siamese, Pounce, Tortie, Haiku, Fraidy, Peso, Daniel Tiger, Dusk, Stride, Dainty, Spry, Tabby, Betty Too, Still, Levi, Shadow, Sophie, Wink, Ferals, Momma, Charlie, Tux, Cool, Benny, Jellicle, Itchy Valentino, Goldie, Nine, Amanda, Siesta, ChaCho, Charlie, Too, Mika, Crystal, Seeker, Mittens, and Dancer.